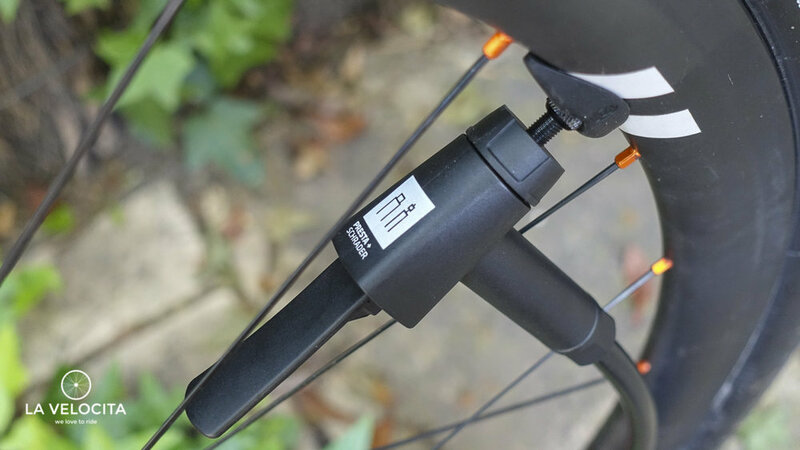 Bontrager TLR Flash Charger pump review - LA VELOCITA. Road tubeless is here, and I’ve jumped aboard the bandwagon with its promise of puncture free riding, lower tyre pressures, and increased comfort. It’s still the Wild West out there with minor variations in rims, tyres, tapes, and sealants meaning that no setups are ever the same. There aren’t a lot of rim/tyre combos that will bed with just a standard low-volume floor pump so many shops and home mechanics have adopted the air compressor. Enter the Bontrager TLR Flash Charger pump with its gigantic pre-load chamber that can store and unleash a burst of air to frighten tubeless tyres onto their rims. This thing is a serious chunk of metal. It works with a simple lever that switches between opening and closing the pre-load chamber. When mounting tubeless tyres, you flick the lever to close the chamber and pump it until the indicator hits a green pressure zone. Then you just attach the nozzle to your valve, flick the lever and unleash hell. So does the Bontrager TLR Flash Charger work? Yes, I had it work a treat. Air whooshes out and snaps the tyre onto the rim easily. Now, there was one set of tyres that wouldn’t go up with this pump but that’s just how it is sometimes. Some tubeless setups are bastards and the mechanic who did manage to get the tyres on did resort to a compressor. Is this a good floor pump for people not using it to setup tubeless? Yes. It has a long stroke, a giant dial set at the top, and a solid base. The only unusual behaviour is air always passing through the pre-load chamber so you’ll hit the tyre psi you want, remove the nozzle, and the residual air will rush out. You can always flick the switch to catch that air and make your next pumping easier. Pump speed is a little slower here because you’re filling the tyre and air chamber. So yes, there’s a few extra strokes involved. The Bontrager TLR Flash Charger's nozzle is Presta and Schrader compatible too which is great for people with road and MTB setups. One problem with that is you need more exposed Presta valve to grab onto than your typical Presta-only pump. I had one bike with only a short exposed valve and this pump couldn’t grab it. It’s also quite hefty at the nozzle so you’ll need to be careful about putting a lot of pressure on valve cores when they’re unscrewed. The Bontrager TLR Flash Charger pump is great for tubeless users. Use it around home or take take it to your CX races and save people who burp their tyres during warmups. Don’t be surprised when your friends start dropping in to use it either. You may find yourself bedding a lot of other people’s tyres. At $189 AUD, this might seem expensive for a pump but it’s a lot more convenient and portable than an air compressor. It’s a quality pump for starters, and it’ll help you mount your tubeless tyres. Go on, go tubeless. All the cool kids are doing it. Head on over to the Trek website to learn more and buy the pump. Disclosure statement: This pump was sent for review by the rad folks at Trek Australia. We appreciate and thank them! We’ve been testing Bontrager’s Ion 800 front and Flare R city lights for a few months now and here are our thoughts on their illuminating road products.